We'll make this simple. Let's check first the picture/ illustration below. Copy of which is plastered on each bus. If you are in a hurry, say for example, coming from Kamuning, you're going to POEA then you better ride at Bus B, because in just 3 stops you'll be at POEA na. Tip: Bus A stop only at Bus A designated bus stops. Bus B stop at designated bus B stops. Bus C that stop on all designated Bus stops. Because if you get confused, it might take you longer before you reach your destination, so I think it is better if you check the chart before hopping on the next bus. Be Wa-is! Have a merry Christmas people! ADVISORY: If you want your comment to appear on my site, kindly make sure not to put your link 'coz it will automatically go to my spam folder. To answer the question of a certain Corin: I wrote that article base on MMDA's advisory. Your attempt to scam and mislead my readers will not work because everybody knows that MMDA issued this press release/ advisory and were published accordingly by many bloggers and newspapers.If you are scouting to have traffic on your website, I am so sorry I won't click that link and so as my readers. Sorry if it appeared that way, but I was not trying to mislead or scam you nor the readers. 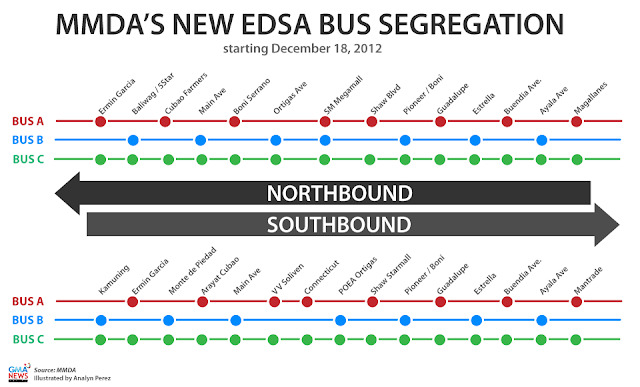 But I did write a blog post months before this advisory/scheme was released by the MMDA that I wanted to compare to this new bus segregation scheme. I am not against the segregation scheme, in fact, I was happy that finally, our government decided to act on improving our traffic problems. I will write (rather, am writing) a new article in response to the MMDA bus scheme to help better improve the current system because I believe that the system can still be improved. I am not trying to gain traffic on my website because I don't really care if people read my blogs or not anyway. Would you rather that I post my entire blog here as a comment so that you would know what it contains? Sorry, took too long to reply. In my personal opinion, I don't think the bus segregation scheme is effective as it should be, because of the following reasons: discipline, volume, strategy and implementation. First and foremost reason, discipline not just for the bus drivers, even for the commuters and the enforcers are very important. Let's say, the bus segregation scheme is implemented (as it is now), if the commuters still wait at illegal (or invalid) places for the buses, the bus drivers (and conductors) who wish to get income more than their competitors, will take their chances in picking up these passengers, and if the traffic enforcers are not strict in implementing this, as well as not being strict with trying to reprimand the pedestrian violators and the bus drivers, they all will still continue this improper behavior. Last but not the least is implementation, which is related to discipline. Like I said, if the enforcers do not try to reprimand the violators, they will not be afraid to violate any rule since there is no punishment.